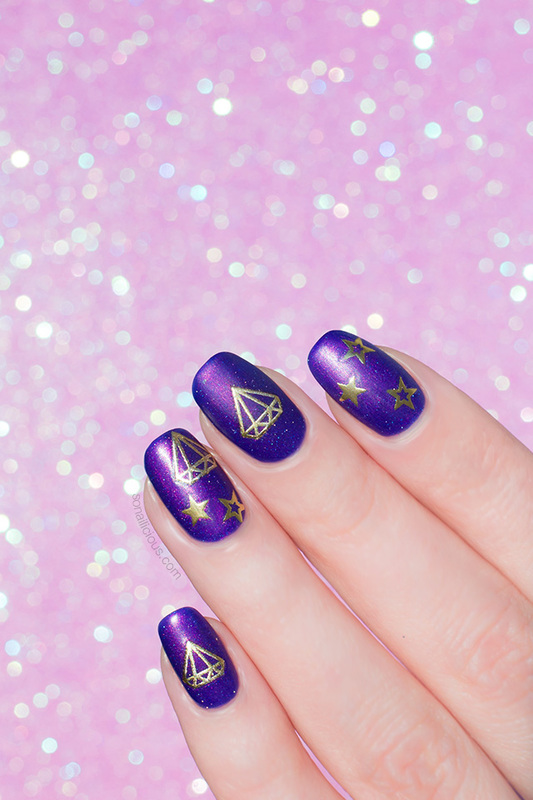 These purple nails with diamonds are perfect for a night out! The holographic purple nail polish, used as a base for this manicure, shines with all colours of rainbow when it catches light and the golden diamonds add that necessary touch of extra luxury. PRO TIP: gold and bright purple colour combo alone can be a tricky one to wear, add to that holographic effect and it all gets out of control. So to make this daring evening manicure work, I’d suggest you wear it with a matte top coat. 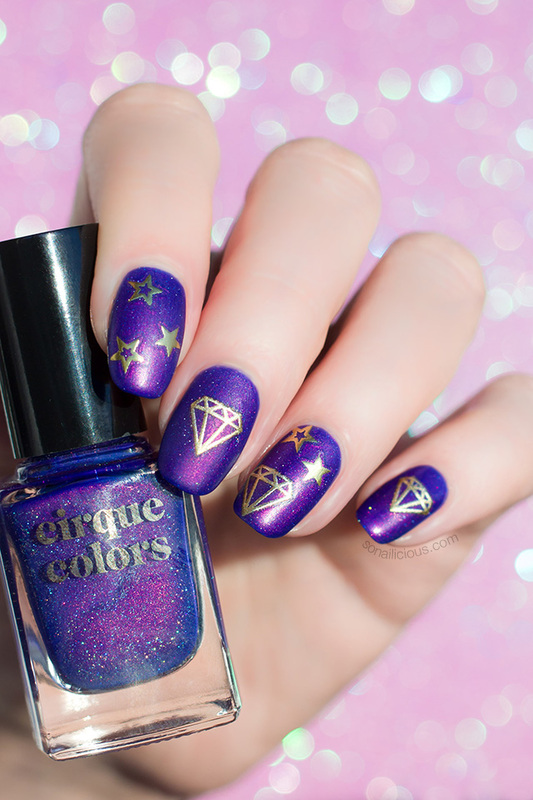 It really makes diamond details to stand out against the bright purple base, as it tames the vibrance of the colour. 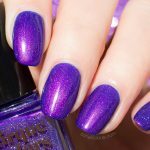 However, if you’re using a dark purple creme polish as a base for your diamonds manicure then a glossy top coat will work best. Enjoy the photos and scroll down for the HOW TO below! 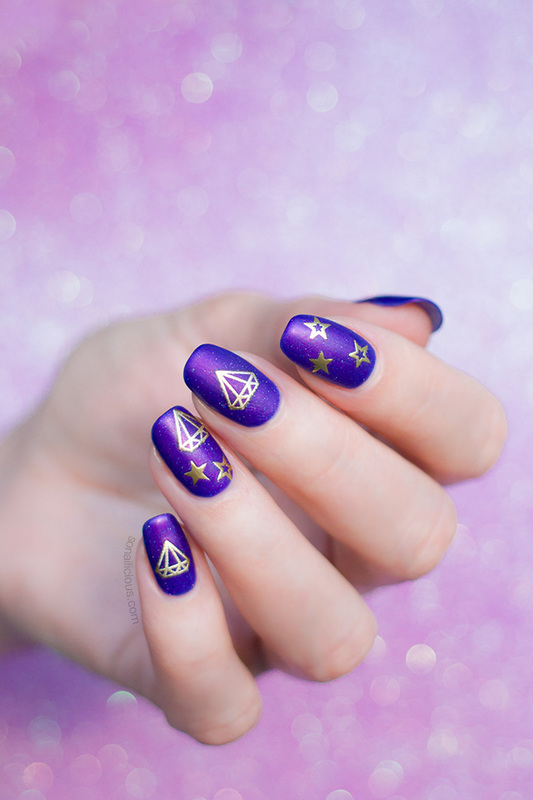 Paint all nails purple nail polish andwait until nail polish is dry. Attach diamonds from Love & Peace nail sticker sheet on all nails as pictured. 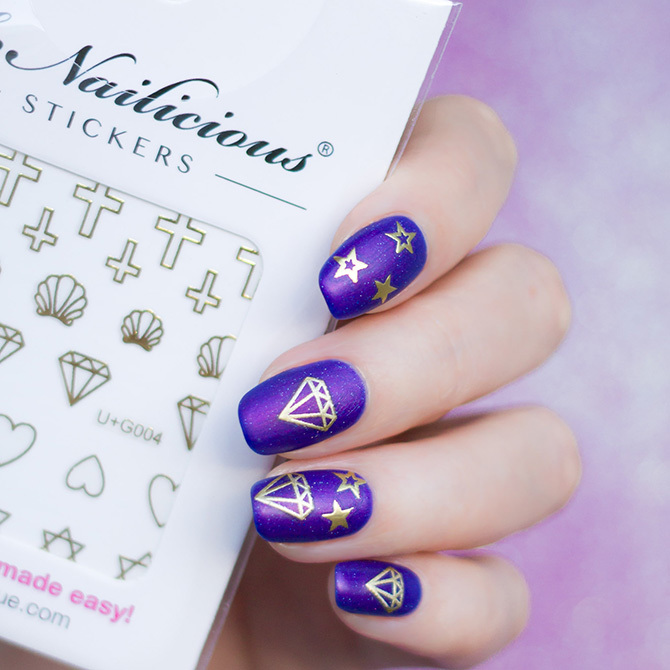 Attach stars from Summer Love nail sticker sheet on all nails as pictured. PRO TIP: use this silicone tool to apply your nail stickers flawlessly and without touching the sticky surface. Also, watch this nail tutorial to see how to apply them like a PRO. 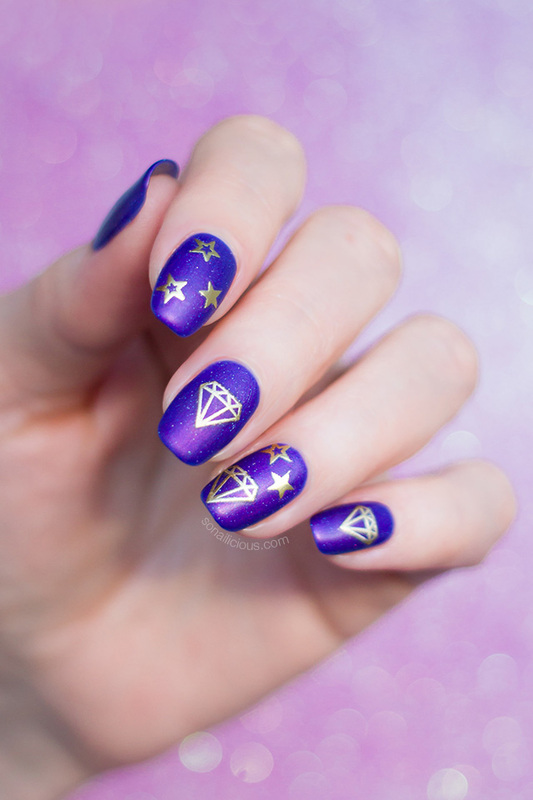 How do you like these purple nails with diamonds? 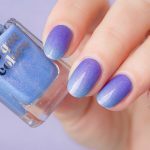 Would you wear an evening manicure like this or is it too much? P.S. 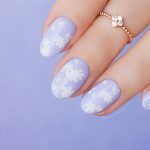 If you created any nail art with the SoNailicious stickers make sure you show me your manicures! 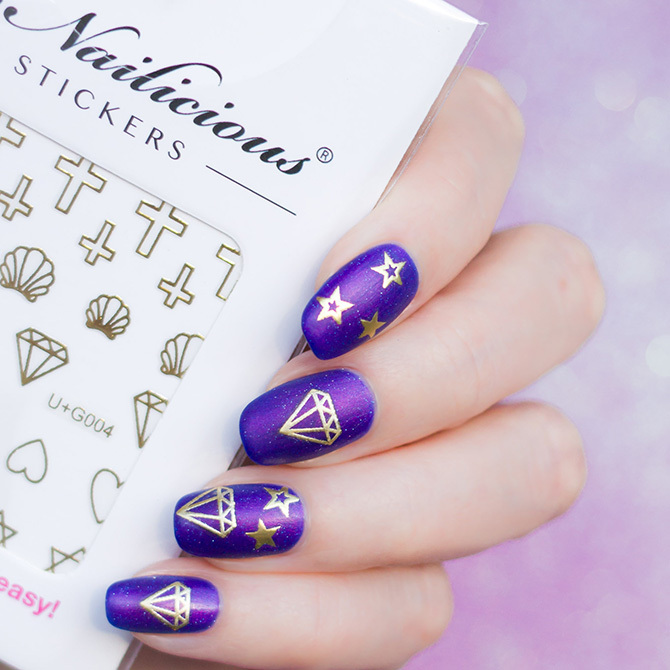 Use the hashtag #SoNailiciousStickers to share your photos with the fam on Insta and Twitter. Dis you enjoy this post? Let’s stay in touch!